Series creator Ron Gilbert may have parted ways with LucasArts, but that didn’t stop the company from continuing the Monkey Island franchise, and in 1997 The Curse of Monkey Island marked a welcome return to the wacky world of Guybrush Threepwood. Helmed by the team that brought us Full Throttle, the third game changed the look, sound, and feel of the series considerably, but kept the familiar humour that we’d all come to love. The stunning graphical overhaul was evident from the get-go. Gone was the darker, more realistic pixel art look of LeChuck’s Revenge and in its place was a more vibrant, hand-painted cartoon style that still looks great today. It also managed to build successfully on the established brand, introducing excellent new additions like Murray the talking skull and some exotic new locations. 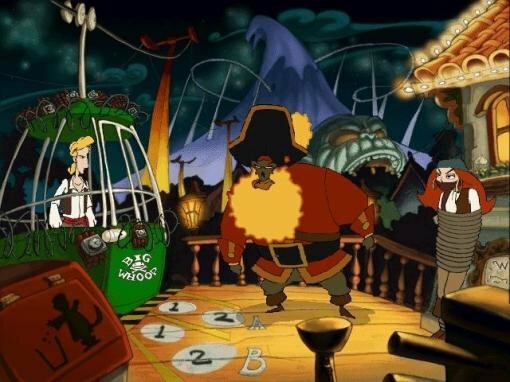 The most important addition to the series, however, was the inclusion of voiced characters for the first time: Guybrush, Elaine, and LeChuck were now brought fully to life by the likes of Dominic Armato, Alexandra Boyd and Earl Boen. Suddenly there was new depth to characters we already felt comfortable with and all proved immensely popular, the actors continuing in their roles even to this day. 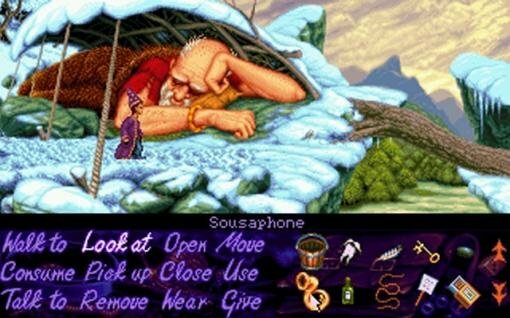 The game was not immune to criticism, mainly focused on its short length and abrupt ending, and it never quite achieved the heights of its predecessors, especially by those who questioned its place in Monkey Island canon. Still, it’s undoubtedly an excellent continuation of the series and a fantastic adventure game in its own right. Simon the Sorcerer is a very British game. It takes a certain sense of humour to truly enjoy everything it has to offer, but for those who share it (and there are many), this is a wonderful game. Released in 1993, Simon was AdventureSoft’s breakaway property after a string of minor successes. A full-blown parody of fairy tales and fantasy tropes with a particularly dry sense of humour, a Disney classic this is not. From the pig-faced Rapunzel to the drunken dwarfs, few beloved children’s characters survive unscathed. Simon himself is an obnoxious youth with few redeeming features, and the supporting characters are equally repellent. All the elements are wrong, and yet the finished result is not only charming, it is extremely fun to play. The young apprentice’s first journey into the vast and vibrant magical realm made use of revolutionary technology at the time, sporting some beautiful living backdrops that kept the forest perpetually alive. The soundtrack was similarly lauded for its accomplishments, offering tunes you could easily identify even now if heard out of context. The script is chock-full of fantastic put downs and witty one-liners brilliantly voiced by Chris Barrie from Red Dwarf, and although Simon is thoroughly vile to everyone he meets, you can’t help but love the guy. The save-the-world-from-evil-sorcerer story is thin, and the puzzles are often odd inventory combinations that make little sense, but Simon’s first adventure qualifies as a bona fide classic that went on to spawn four different sequels and a couple of spin-off games. Not bad for that other British teen wizard. 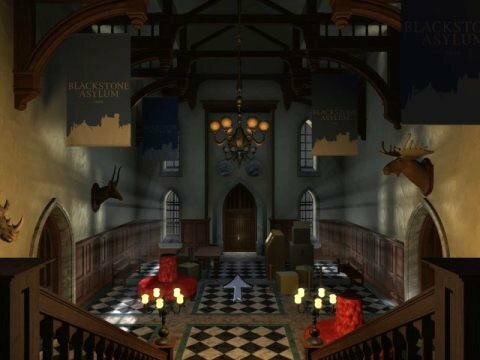 Another underrated (though not by us) adventure from Legend Entertainment is John Saul’s Blackstone Chronicles, a chilling 1998 adventure that takes place entirely in a former insane asylum. Picking up several years after the serialized stories of John Saul left off, the asylum is now a Museum of Psychiatric History that Oliver Metcalf must explore in search of his son, who’s been kidnapped by his own father, the last superintendent before the asylum closed down. The problem is, his father is dead, and he isn’t the only ghost lurking within these walls. Accurately billed as an “adventure in terror”, it’s not because the game uses cheap scare tactics and gory images. There is no observable violence, bloodshed, or gore. The horror in Blackstone Chronicles is purely psychological – only ever implied, and 100% human. It's subtle, clever, and insidious, and though it's less frightening than it is disturbing, the more you invest yourself in the story, the more alarmed you'll become. The true heart of the game is delving into the experiences of those who suffered through torturous treatments in the name of mental "health care." Reading about abominable real-world historical treatments is made all the more horrific when you listen to the first-hand accounts of ghostly former patients. If you aren’t touched by the heart-rending fate of the little boy who simply liked playing with dolls, you don’t have a heart. You’ll even get up close and personal with such actual devices as the electroshock chair, a coffin-like heat chamber, and the fever therapy device where patients were cut open and bled. A few timed puzzles only add to the frightening atmosphere, requiring quick thinking rather than reflexes, though that’s hard to do when your pulse is pounding a mile a minute. All the while, Oliver’s father Malcolm provides one of the most impressive acting performances ever – his voice, tone, and delivery all perfectly conveying the arrogant, calculating, emotionally disconnected sociopath he clearly is. Combined, these factors make Blackstone Chronicles an overlooked revelation among adventures, proving once and for all that true horror begins in the mind. Robin Hood is one of those legendary characters who has made a lasting impression, forever imprinted in our collective imagination. In the second (and sadly final) adventure in the short-lived Conquests series from the pen of Christy Marx, one of Sierra's finest designers (if often forgotten among more recognizable names), Conquests of the Longbow put players directly into Robin's leather boots in 1991 to embark on a classic cloak-and-dagger adventure. It's a powerful tale, backed by copious details about Druidic folklore and English history, in a world populated by iconic characters like Little John and Will Scarlett, the Sheriff of Nottingham and Maid Marian, here in the imaginative role of a Druidic priestess. The gameplay also proved to be incredibly fun, full of innovative puzzles and challenging riddles flawlessly integrated with the storyline. The real pièce de résistance of The Legend of Robin Hood, however, is the player-guided nature of the gameplay that allows for branching paths and multiple finales. Depending on the choices made and actions taken at pivotal moments, the game plays out a little differently, and there are four possible outcomes that take into consideration how successfully Robin worked against Prince John and his sycophant, the Sheriff, to restore England's rightful ruler to the throne. 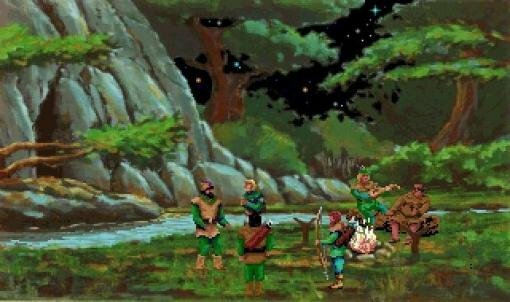 The lavish graphics and beautiful, fairy tale-like soundtrack significantly add to the mood, creating an exciting adventure that offers just the kind of entertainment one would expect of a Hollywood movie about the Prince of Thieves (and much better than the ones we usually get). 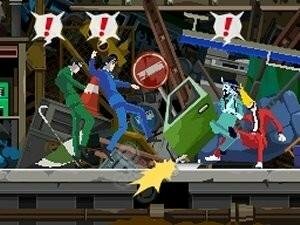 Rather than continuing to milk the safe gameplay formula of the successful Ace Attorney series, in 2011 Capcom’s Shu Takumi created Ghost Trick: Phantom Detective, a non-sequel with an entirely new gameplay mechanic. The result was a unique and satisfying experience that shows the risk taken was a thoroughly worthwhile one. The ghostly Sissel has just one night to solve the mystery of his own death, and interacting with the world comes solely through possessing items and using his supernatural will to operate them. Using these “ghost tricks”, Sissel accomplishes tasks from simply getting around to foiling assassinations and escaping sinking submarines. The variety of tricks available provide diverse and interesting puzzle challenges, further increasing in complexity when a second spirit with different abilities is later added to the mix. Thankfully, having broken away from the pack with an interesting new gimmick, the designers did not just rest on their laurels. The game also boasts gorgeous anime-style graphics with a wealth of detail packed onto the small Nintendo DS screens. All scenes, from an opulent office to a junkyard set against a cityscape backdrop, are a pleasure to the eye and filled with a variety of interesting and beautifully animated characters. The ghost trick control system is also developed far beyond its basic premise. When encountering a dead body, your spirit self can travel back to four minutes before they died, rewinding time as often as necessary to prevent their sad fates. Topping all this off is a plot that twists and turns, constantly changing the player’s understanding of events. The combined result is a one-of-a-kind game that deserves to be in any adventure gamer’s collection.